உலகம் முழுவதும் வாழும் தமிழ் நண்பர்கள் மற்றும் வாசகர்கள் அனைவருக்கும் இனிய தமிழ் புத்தாண்டு நல்வாழ்த்துக்கள் !! May the fruit of your happiness ripen this year.. May success be all yours !! The Varushapirapu is the Tamil New Year, it is a time for celebrating new and prosperous beginnings. The 14th of April is the beginning of the first month Chithirai of the Tamil year, which is celebrated as the New Year. 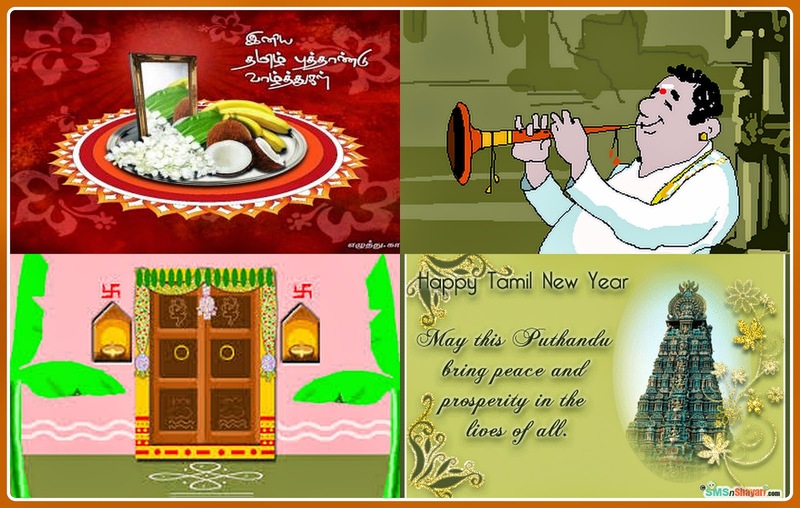 Tamilians exchange greetings of "Puthandu Vazthukal", meaning Happy New Year on the auspicious occasion of Tamil New Year. The 14th of April marks the first day of the traditional Tamil calendar and is a public holiday in both Tamil Nadu and Sri Lanka. Tamilians believe that it was on the Tamil New Year's Day that Lord Brahma started the creation of the world. What is fascinating about the Tamil New Year's Day is that it happens to be the Chithirai Vishu, Malayalam New Year Day and Bengali New Year Day too. Ella Malayalikalkkum Enthe Hridayam Niranja Vishu Ashamsakal !! 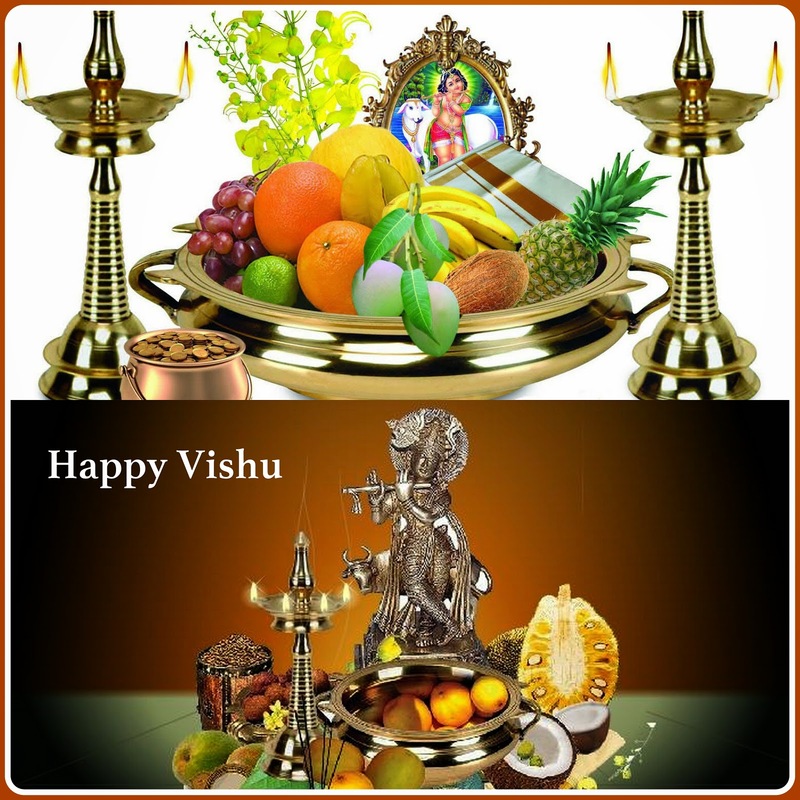 Wishing you luck in every aspect of life.. Have a prosperous Vishu !! "Vishu" in Sanskrit means "equal". The most important event in Vishu is the Vishukkani, which literally means "the first thing seen on the day of Vishu after waking up". The Vishukkani consists of a ritual arrangement of auspicious articles like rawrice, fresh lemon, cucumber, betel leaves, arecanut, flowers and coins. The Vishukkani, also called Kani kanal, is inseparable from Vishu. According to the age-old belief of Malayalees, an auspicious kani (first sight) at dawn on the Vishu day is lucky for the entire year. As a result, the Vishukkani is prepared with a lot of care to make it the most positive sight so as to bring alive a wonderful, propitious year ahead. The responsibility of decorating the Kani belongs to the oldest lady of the house. Happy new wishes to u too..